To download PDFs of the Four-Year and Two-Year charts comparing our data to IPEDS and SAM, see the Report tabs below. Data points available as of Summer 2017. CSRDE offers three levels of institutional membership with additional data and webinar access at higher levels of participation. Complete this quick online form and we’ll email you a PDF with information on fees and other details specific to your institution. 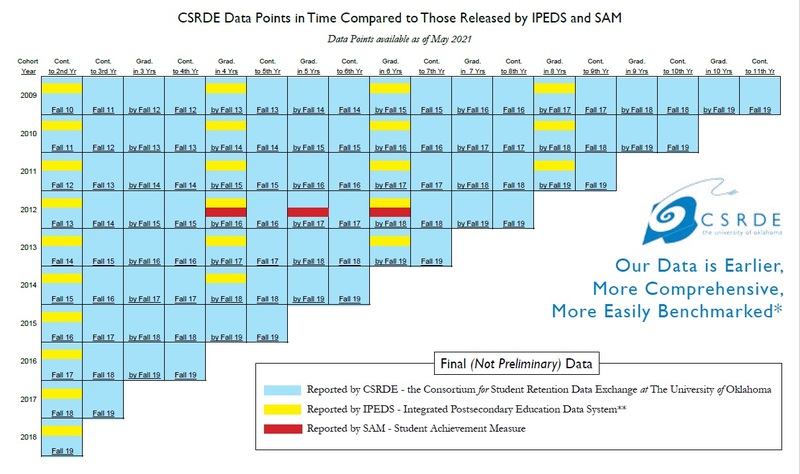 Our members have earlier access to more comprehensive retention and graduation data than that released by IPEDS and SAM. All CSRDE report data given by total cohort and broken down by gender and race/ethnicity. Colleges and universities are always looking for ways to improve the success of their students and it is our mission to help you. Our annual reports provide the information you need to easily fulfill requests for benchmarking data to accrediting agencies and other entities. Your participation in our data-sharing consortium demonstrates your institution’s proactive efforts to self-monitor and review progress. Offered to two-year and four-year, public and private nonprofit colleges and universities, institutional membership provides access to timely, comprehensive benchmarking data on retention and graduation. This information is not available from any other source. Participants submit data for our annual reports, and the CSRDE handles the data auditing, internal consistency checking, analyses and reporting, saving the institution time and money. All members submit data for at least one of our four annual retention reports as a condition of membership. For each survey completed, the participating institutions receive a copy of the corresponding report within a few months. Members agree to use the CSRDE data for internal benchmarking purposes only and to maintain the confidentiality of fellow consortium members’ data. All four-year institutions participate in this report, and any two-year institutions with baccalaureate degree-seeking students may participate at no additional cost. The survey of first-time, full-time, baccalaureate degree-seeking students, known as Section 1, collects 2nd to 11th year continuation and 4th to 10th year graduation rates for ten cohorts and sub-cohorts based on gender and race/ethnicity. Characteristics data are also collected for use in benchmarking. Compare our data to IPEDS and SAM data. The CSRDE Retention Report for four-year institutions provides trend and summary tables with aggregate retention and graduation rates grouped by institutional characteristics, gender and race/ethnicity, as well as institution-specific data in the appendices to aid in peer comparisons. All two-year institutions submit data for this report, and four-year institutions with certificate and/or associate degree programs may participate at no additional cost. This survey, referred to as Sections 1&2, tracks institution-wide data for ten cohorts of first-time, full-time and first-time, part-time certificate and degree-seeking students, including sub-cohorts by gender, race/ethnicity and those taking remedial courses. Participants provide 2nd to 11th year continuation and 1st to 10th year graduation rates, as well as characteristics data useful for peer comparisons. Compare our data to IPEDS and SAM data. The CSRDE Retention Report for two-year institutions includes trend and summary tables with aggregate data provided by gender and race/ethnicity as well as institutional characteristics. The report is divided into two sections—full-time and part-time students—and offers institution-specific data for help in benchmarking. Four-year institutions are invited to participate in this optional survey at no additional cost. The STEM survey for Science, Technology, Engineering and Mathematics students, known as Sections 2&3, was developed in the late 1990s with funding from the National Science Foundation. Participants provide 2nd to 11th year continuation and 4th to 10th year graduation data for ten cohorts of first-time, full-time, baccalaureate degree-seeking students who enter with an intent to major in a STEM discipline. Gender and race/ethnicity data is also included. The CSRDE STEM report has proven helpful for institutions in writing grant proposals and responding to requests for STEM data. It includes summary tables grouped by gender, race/ethnicity and institutional characteristics, and institution-specific data in the appendices. This publication combines results from our report of all first-time, full-time students (Section 1) to offer data for both STEM majors and all first-time students. Four-year institutions that have transfer students entering from two-year institutions with at least 30 hours are invited to participate at no cost. In 2005 the transfer survey was developed to include full-time and part-time degree-seeking students entering the four-year institution having completed at least 30 hours at a two-year institution—the equivalent of at least one year of study. The survey tracks retention and graduation data on ten cohorts of students, including gender and race/ethnicity, and provides 1st-year graduation through 11th year retention data. Top five feeder schools and data related to the entire transfer population at the institution are also collected. The CSRDE Community College Transfer Report includes summary tables grouped by gender, race/ethnicity and several institutional characteristics. It also provides institution-specific data in the appendices to aid in peer comparisons. Measuring the Success of Transfer Students: A New Metric Evaluated explores the usability of CSRDE’s transfer data to investigate the success of a previously unidentified cohort of students—those transferring from community colleges. The paper, presented at the 2016 Association for Institutional Research (AIR) Forum, uses means, correlations and hierarchical linear modeling to evaluate the data for reliability and validity. The CSRDE Quick Query System puts comprehensive retention and graduation data at your fingertips. This online system draws directly from the data used in the published reports and facilitates quick responses to internal and external requests for benchmarking data. The institution’s level of membership determines the amount and type of data available. Members may create one Peer Report for each of the studies in which they participate, regardless of membership level. After receiving the published report, the institutional contact uses the system to select a peer group of five to 20 institutions to generate the four part Excel report. Level 2 and Level 3 members may also generate Summary Reports. In these, peers are chosen using variables such as Carnegie Classification, selectivity, size and control. Year-to-year aggregate retention and graduation data on ten cohorts of students, including gender and race/ethnicity rates, offer higher education colleagues needed comparisons not easily obtained from any other source. There is no limit to the number of summary reports you may create using this tool. Level 3 members may select peer groups of 5-20 institutions from which to create Ad Hoc Summary Reports. These are similar to the Peer Report except provide only the summary portion with the aggregate data for each group, together with the characteristics and documentation of each institution chosen. Join Us Now! Your Entire Institution Will Benefit. Institutional contacts are given access to our Knowledgebase, where all peer-reviewed papers from each symposium are archived on our Members’ Portal. Your entire institution could benefit from access to The Proceedings of the National Symposium on Student Retention and webinars. The 2018-19 webinar schedule, complete with authors and abstracts, is now available here. One to six webinars are included in membership and are available to the entire institution. Additional webinars may be purchased at a discount. All faculty and staff at member institutions receive discounts to attend the National Symposium on Student Retention, hosted by CSRDE, and to purchase the Proceedings at a discounted price. Faculty and staff at member institutions receive a discount when purchasing our dynamic electronic book, Building Bridges for Student Success: A Sourcebook for Colleges and Universities. The CSRDE membership year is from October 1 through September 30 of the following year. Registration is accepted throughout the year. We recommend, however, that new members submit their application by mid-November in order to have adequate time to gather the retention and graduation data for our annual reports.